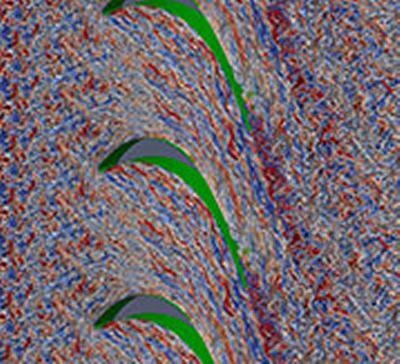 Researchers from the University of Southampton are aiming to shed new light into the physics of turbulent flows inside the turbines of aero-engines. The aerodynamics of the turbine blades affects the efficiency of the engine, while the heat transfer from the extremely hot gas to the turbine blades is harmful to the life-span of the turbine. To determine the effects of turbulence and flow unsteadiness on the aerodynamics and the heat transfer from the gas to the metal blade, it is necessary to understand all the temporal and spatial scales in the flow. However, experimental measurements have, to date, not been able to provide data with enough depth to identify all the fundamental mechanisms and to explain weaknesses of currently used design tools, due to the difficulties of performing engine-scale experiments and acquiring spatially and temporally resolved data. The Southampton research team, led by Richard Sandberg, Professor of Fluid Dynamics and Aeroacoustics, and including Dr Andrew Wheeler and Professor Neil Sandham, has identified that Direct Numerical Simulations (DNS), a model-free approach based on first principles (no assumptions or modelling are used) can help to develop an improved understanding of the role of turbulent phenomena in the flow-field and determine the validity of current turbulence modelling. To further this research, the team has been awarded 35 million hours of computing time on a supercomputer in Stuttgart, Germany, through a grant from the Partnership of Advanced Computing in Europe (PRACE). The team has also received a grant in the US for another 10 million CPU hours on the world’s second fastest supercomputer (Titan) at Oak Ridge National Laboratory. The combined allocation, corresponding to more than 5,000 years of computing on a single processor, will be used to perform simulations of flow through turbines of aero-engines. The project is in close collaboration with world-leading aircraft engine provider GE, who are providing technical support and will play an integral part in the analysis of the data. GE will be able to implement the results of this work throughout their international aero-engine business and therefore this work, besides resulting in scientific publications in leading journals, also has the potential to deliver a significant change to global aviation.